On paper, it would appear that the Minnesota Wild have a strong team heading into the 2015-2016 NHL season. They retain most of the roster from last season that catapulted itself from the depths of the Western Conference to a playoff spot by going 28-9-3 from January 15th on, Devan Dubnyk was locked up with a long-term deal, and they were able to add the functional equivalent of a first round pick by signing Mike Reilly in free agency. With that in mind, the Wild should be quite optimistic about the upcoming season. However, its worth noting that all teams face obstacles on the path to the ultimate goal; the ensuing are a few hurdles Minnesota may have to jump this season. Perhaps the question looming largest over the Wild right now is how Devan Dubnyk will perform this season. He was the biggest reason for the turnaround made by the Wild last year after he took over in goal following the trade from Arizona. Now he has a new contract but was his performance last year a trend or a mirage? Dubnyk went 27-9-2 with a 1.78 goals-against average, a .936 save percentage, and five shutouts for Minnesota in the regular season. While the numbers would seem to indicate that his performance was more than just a fluke, questions remain. When Dubnyk arrived last year, Minnesota was hovering barely above .500 and the season was spiraling out of control. To be quite frank, the Wild’s goaltending situation could not possibly have been made worse by Dubnyk, so the pressure to perform was not as high as it will be this year after he showed what he was capable of last year. How will he respond to the pressure of expectation following a breakout season and a shiny new six-year deal? Wild fans hope it’s with more saves of this caliber, but only time will tell. How will Devan Dubnyk perform in his first full season with Minnesota? Another thing to keep in mind is that Dubnyk has never had a legitimate run at the no.1 goalie position with a contending team and he has shown inconsistency in the past (something my colleague Alli Baker touches on here). It’s not known how his mind and body will hold up to the strain of being the day one starter in the nets. Sure he played 39 of the final 40 regular season games but that was coming off of a year where he played very sparingly and thus was well rested when called upon by the Wild. The health of Devan Dubnyk is perhaps the most vital factor in determining how Minnesota’s season will shape out. Depth at goalie is lacking for the Wild and one Dubnyk injury could be enough to derail the entire season. Making sure to closely monitor him will undoubtedly be a focal point for Mike Yeo and his coaching staff. While the performance of Devan Dubnyk came as a welcome surprise, the underwhelming showing from several veterans was a point of frustration all year for Wild faithful, as was the seemingly stunted growth of Minnesota’s young players. Will Thomas Vanek regain his prolific scoring touch this year? particular seemed to struggle mightily in the early stages of the season scoring just 7 goals through January 13th before turning things around in the second half and scoring at what would’ve been a 30 goal pace projected over 82 games. Pominville had a sub-par season by his standards as well scoring only 18 goals while playing all 82 games and struggling to capitalize on a bevy of scoring chances particularly on the power play. Koivu also had a lackluster season with just 14 goals and 48 points. The long-tenured Wild captain also showed his age in his skates, often looking a step slow as well. 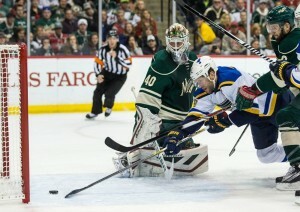 On the bright side, he managed to stay healthy for most of the year and was Minnesota’s most reliable faceoff option. However, Koivu is the second line center and needs to produce at a higher clip than he did last season, especially if he’s surrounded by the likes of Vanek, Jason Zucker, and Nino Niederreiter; players all capable of putting the puck in the net amply. The Wild also had disappointing seasons turned in by several of its young core, most notably Mikael Granlund. While struggling with injuries and playing only 68 games, Granlund managed a modest 39 points centering the top line. With Pominville and Zach Parise on either wing, he should be amassing points at a much higher rate, especially considering that Granlund is not a rookie anymore; he is a veteran of over 150 NHL games. Despite his limited inclusion in the power play, this must be the year that sees Granlund take a big step forward in his development and begin to accumulate points at a level requisite of a first line center’s pace. Erik Haula is another young Finn that had many Wild fans scratching their head last year. After a fine finish to the regular season and an excellent playoff showing in 2013-2014, Haula took a massive and unexpected step back last season and he just got a new contract this offseason as a restricted free agent. Whatever the reason for Haula’s discouraging year, be it lack of physical preparation or perhaps simply a feeling that he had “made it” based on his stretch of play the year previous, it would behoove both Haula and the Wild for him to come in this season fresh, ready to put last season behind him, and prepared to make the team and help solidify the center position in Minnesota. With a roster that will likely include a minimum twelve players at 25 years of age or younger, the Wild will again be a team highly reliant on its youth. Players like Granlund, Haula, and Coyle must step up while the likes of Niederreiter and Zucker need to continue to be consistent threats up front. Add in Matt Dumba, Jonas Brodin, and possibly Mike Reilly on the back-end, and Minnesota will likely go as its youth goes with help from veteran leadership. It’s not lost on many that the Wild’s power play was abysmal last year tied for 27th in the league at 15.9%. Countless games played out in which the Minnesota power play had multiple opportunities to tie or even take the lead in a game and yet time after time, it failed to do so; usually in embarrassing fashion with little to no zone time and general dysfunction. That must be rectified this year. The main problem with Minnesota’s power play is this: predictability. Opposing teams know what the Wild’s first unit is going to try to do on every single power play. They are going to methodically pass the puck around the zone while ultimately trying to get the puck to the high slot for a tip or one-time chance. Creative passing is lacking and quite frankly, some of the veterans need to yield to the youngsters in this case. It would probably bode well to not always have Ryan Suter being the point man on the power play. It would allow other players perhaps more offensively creative and more willing to shoot to get an opportunity while allowing the workhorse that is Suter to take a breather for more than thirty or forty seconds. That is a concept that could bode well for Suter’s longevity; something that should be a point of emphasis for the team that has him under contract for another decade. It could also be argued that Mikko Koivu simply doesn’t belong on the half wall of the first power play unit. Perhaps Mikael Granlund could be a better fit at that position by getting the puck to Parise down low more efficiently as well as posing a more offensively dynamic obstacle for opposing penalty kills to cope with. What we do know is that no coaching changes are being made on the power play and with systems being the same, the only thing that can be done is to try to move some players around to create more chemistry and innovation on the man advantage. Despite all the preceding, the Minnesota Wild should have high expectations heading into this season. This is a team that has made the playoffs three seasons in a row and one that appears ready to take that next step and truly contend for a Stanley Cup. However, like all teams, it will face challenges before that can come to fruition. These are a few of those potential challenges. For the sake of the beleaguered State of Hockey faithful, the hope is that these are overcome.